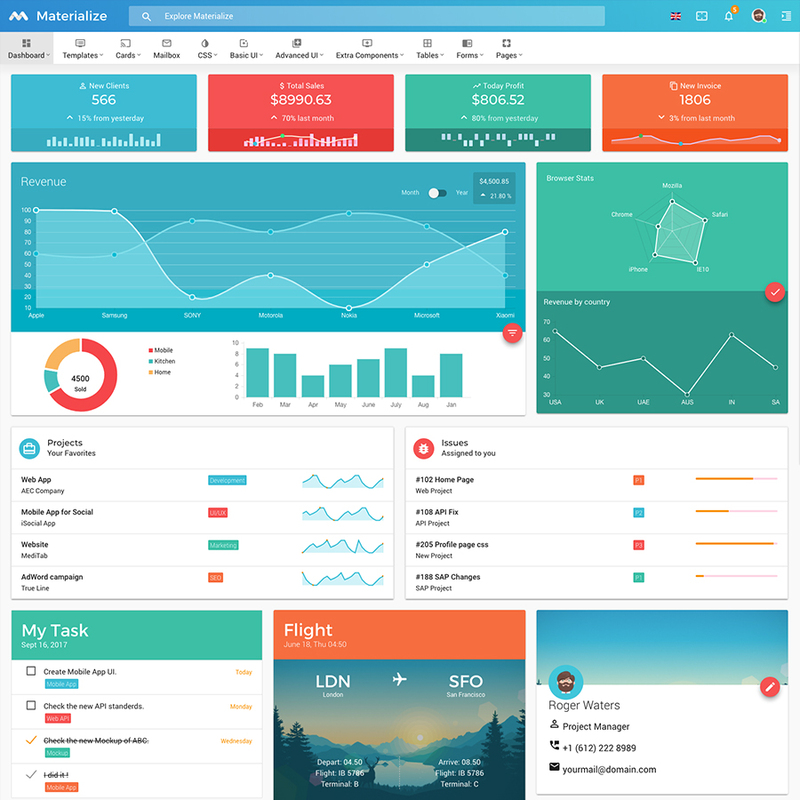 Materialize – Material Admin Template is the #1 selling material design admin template. 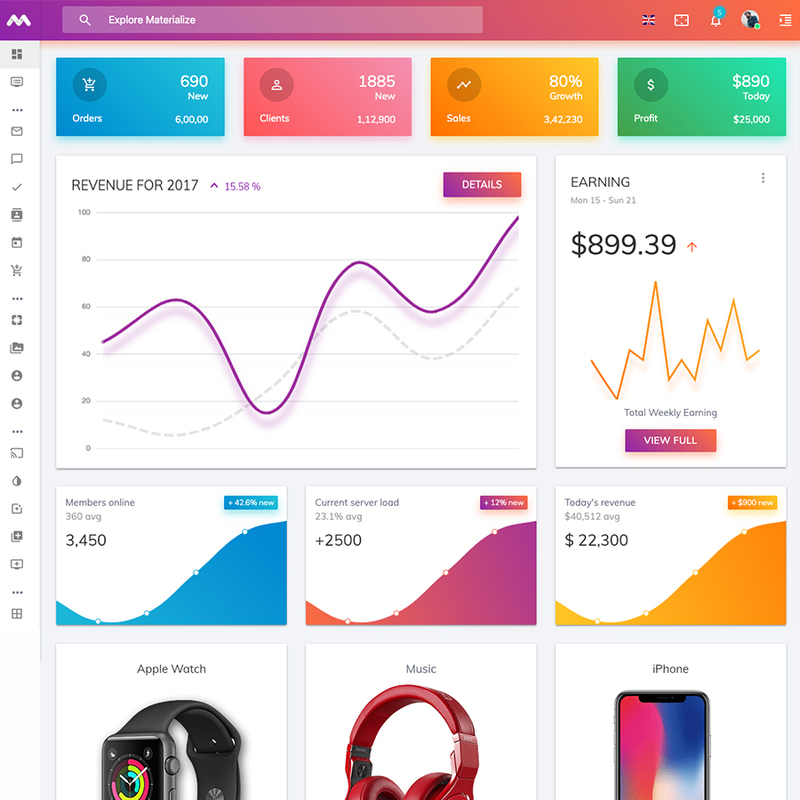 Google Material Design Inspired UI with gradient colors, responsive design and amazing support are the reasons of our customers to fallen in love, making it the most trusted and complete Material Design Admin Template on the market. 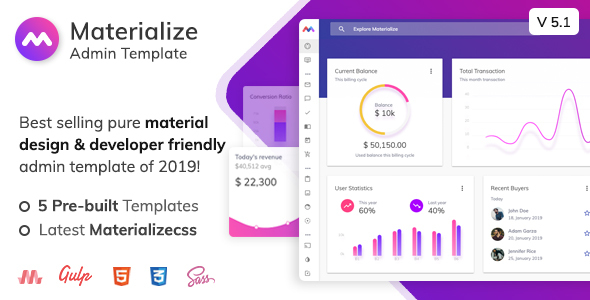 Materialize – Material Admin Template has a huge collection of material design animation & widgets, UI Elements, jQuery plugins and works seamlessly on all major web browsers, tablets, and phones. User-friendly, intuitive, and fun to use. 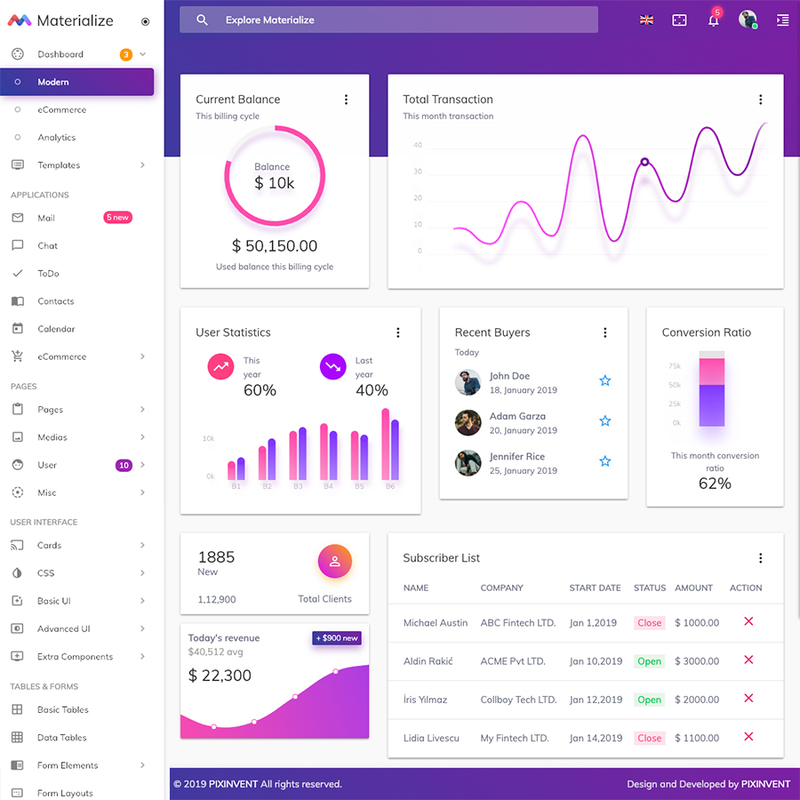 Materialize – Material Admin Template can be used for any type of web applications dashboard: custom admin panels, admin dashboards, CMS, CRM, SAAS and websites: CMSs, SAAS, CRM, HRMS, Support & Social portal, e-commerce, personal business, corporate. 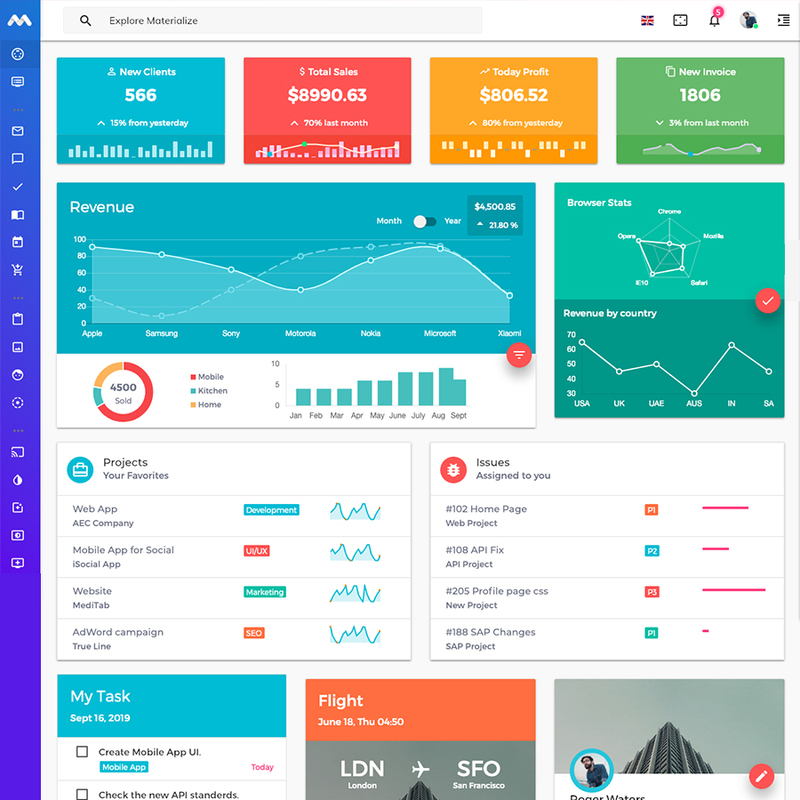 Materialize – Material Design Admin Template has a minimal, sleek, clean and intuitive design which makes your next project look awesome and yet user-friendly, Have look Materialize today! -Add new layouts pages for light, dark, semi-dark, fixed footer and collapsible menu options. 1.Added a custom.scss file for making custom changes using SCSS. 1. Fixed navigation bar issue on small screen for Horizontal & full-screen layout. 2. Fixed card reveal effect and make made it more smooth. 3. Fixed chartist error on single pages like login, register etc..
1. Ready to use 8 predefined theme. 1. Fixed popup close issue on click of popup out side (body) area. 2. Fixed the datatables row display select dropdown hide issue. 3. Fixed the floating button hover issue. 4. Fixed sparkline chaer hover stats background display issue. 5. Fixed the dount chart stats position. 6. Added the open close state menu icons and color. 7. Added notification dropdown and county flag dropdown for translation. 8. Fixed chart lag, scrollbar and map marker issues. - Add new floating action button. - Update materialize the SASS files. - Fix the trending chart lagging issue.